We at DFX are proud to announce that the Buell Foundation recently awarded us $20,000 in grant funding! This grant funds our Wraparound Initiative, designed specifically for children up to 5 years of age to receive needed support in the home or at school. In general, we have found that this extra support helps families to apply what their child has learned in the clinic to the home environment. School consultations, as part of Wraparound, help teachers better understand and plan for the children who receive services at DFX. Sadly, current health insurance plans do not support home or school visits by clinicians to provide this essential and necessary service, which we know is integral for treating the whole child and ensuring a successful path forward for both child and family. 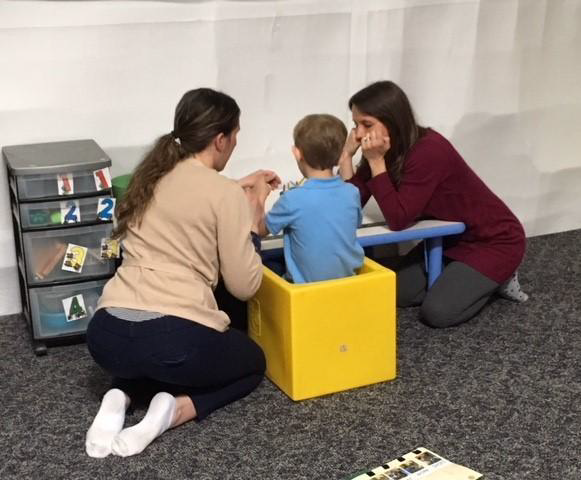 Ruth (R), speech language pathologist and Erin (L) OT student, collaborate in a treatment session. A week earlier, Ruth utilized Buell funds to provide a three hour training to this boy’s school to help teachers and staff better understand how to work with him. Wraparound services in the home include parent and family training, parent coaching, setting up play environments in the home, and helping families follow through on treatment goals. In the school setting, Wraparound services include our clinicians observing in the classroom and helping teachers understand how to best serve the child’s needs, or how to help the child engage in his environment. An additional and very important aspect of Wraparound, in home or school, is to facilitate coordination of care across professionals in the school, home, and clinical settings. We thank the Buell Foundation for giving us this opportunity to further the reach of our services and to assure a better outcome for the children and families we serve.